This morning I finished the last bit of washing up to be done on the Accordion Room, and now we are in plaster-repair mode for a while. Here we are all washed and ready to go (can you believe that's a North window in the winter? It was a really nice day out today). Man, that was a tedious job. Some parts scraped really nicely and hardly needed any scrubbing, but others would not scrape off at all and needed really vigourous scrubbing to come clean. And wow, do your arms get tired of working hard above your head. I'm just saying. This week will be all about making cosmetic repairs to the plaster and stabilizing the large parts of it that are entirely loose. 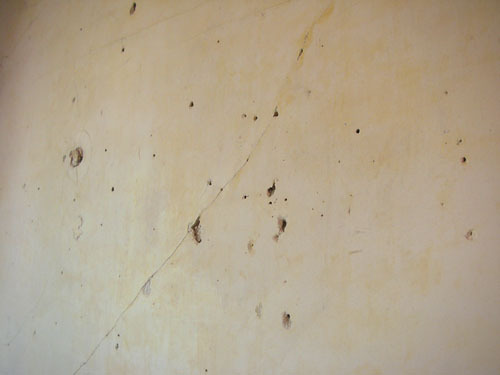 Most of the holes are obviously from hanging pictures on the walls, like these (and that large crack from an earthquake past, but those are actually not as bad as they look). 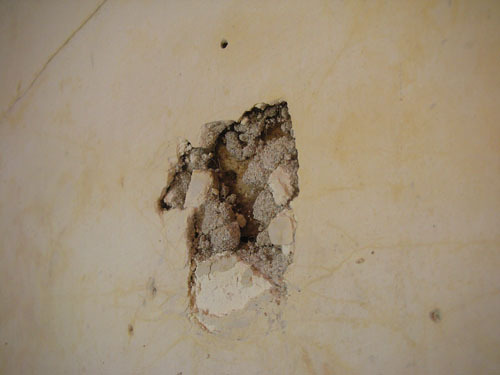 Other holes are the result of the lost plaster keys, which ought to hold the plaster on the wall. In much of the house the keys have been broken off, and the Accordion Room is no exception. When that happens the plaster gets very loose and any impact causes big holes, like this one, characterized by bulging out from the lath and just sort of falling apart when you examine it. Those require a lot of careful building up to repair without causing a really really huge hole. Other tasks include fixing some electrical problems in the room, including the minor issue with this light switch. Because I can be very accommodating of weirdness, but not of outright dangerousness. 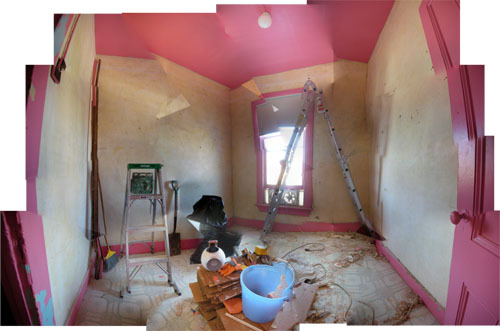 We aim to be able to prime and paint the walls next weekend, so I can work on stripping the flooring next week. Will we make it? Given our track record, probably not, but we'll sure try. For loose pieces, I get these wide washers (mine are metal; they also come in plastic) and chip out an indentation for them to fit in. Squoosh mud into the base of the crack, screw the washer in with a drywall screw (which will go into lath as easily as a stud), then when it's dry mud over the top. 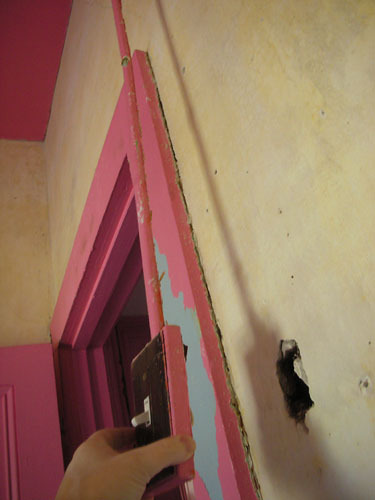 Depending on the level of care I lavish on these methods, it can make the wall smoother or lumpier. Since we're just stabilizing with plans for removing the plaster altogether in a few years, I've been a bit slapdash and the walls have ended up a bit lumpy. here's a post detailing our plaster repair in the hallway. securing the plaster and opening up the cracks are the most important part. I couldn't easily find real lime plaster, so I used a product called concrete fill, it's like durabond with fibres in it.